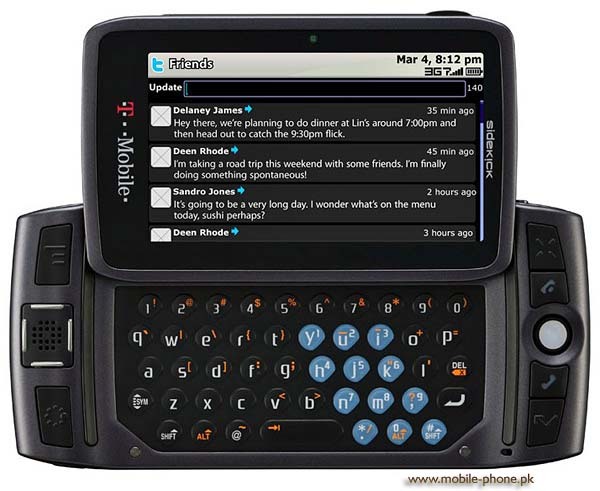 Read T-Mobile Sidekick LX 2009 mobile reviews, opinions, user question & answers. Get free T-Mobile Sidekick LX 2009 mobile via Lucky Draw by posting T-Mobile Sidekick LX 2009 mobile reviews and opinions. Bhai mujy T-Mobile sidekick Lx 2009 chaiya agr kisi k pas hy to plz rabta krain thanks G.
yar arif tum kahan rahatay ho? will u sell it to me? Where can i get it unlocked? Special code mang raha hai? SideKick dnt have WiFi...i have got Sidekick for sell...with all accessories...Contact me if anyone interested. Does this mobile have wifi ? Is it available in pakistan and if yes then could you tell me the place this is available at ? This phone is my dream mobile phone. This is the one of best mobile phone. Its unique design and features are mind blowing. T-Mobile sets < 10000 to 15000 Rs. T-Mobile sets < 15000 to 25000 Rs. T-Mobile sets > 25000 Rs.